You are here: Home / Craft Activities / Emotions Song : How Are You Feeling Today? Being able to recognise and express emotions is an important land mark of development for small children. Until this point the confusion and anger that they sometimes feel can often cause tantrums and frustration, so it is important to help them learn to understand and identify how they are feeling. How Are You Feeling Today? Is a very easy way to introduce these ideas using an emotions song set to a familiar tune and make it into a game. Emotions Song: How Are You Feeling Today? Oh how are you feeling today? That’s how I’m feeling today. This simple craft is a fun way to introduce the whole subject of emotions and how to recognise them. You can start by drawing some simple cartoon faces on a piece of paper and asking the children to guess whether they are happy or sad etc. When the kids have got the idea, you can let them have a go themselves. These emotion stick puppets are made very simply from felt and lolly sticks with stick on goggly eyes and felt tip drawn mouths and eyebrows. You can have fun with adding some other features like curly hair and noses too. Get the kids to help with the cutting and sticking, but they may need some assistance with getting the mouth expression right. Make sure you have plenty of felt discs handy, so they can have lots of opportunity to experiment. Once you have made a number these emotion stick puppets, you can hand them out at circle time and sing the song. As you go round the circle, the teacher sing the first two lines, asking “How are you feeling today?” and each child identifies which emotion their stick puppet has and sings accordingly. They can use the same words as above, but it really doesn’t matter, the whole point is that they should say what they think and feel, so encourage improvisation. 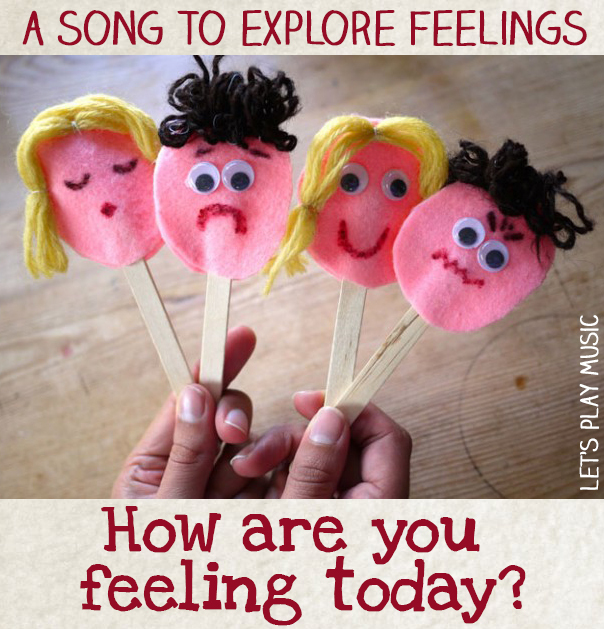 Check out our Feelings lesson plan, for a 35 min structured music lesson specially written to encourage kids to express their emotions. 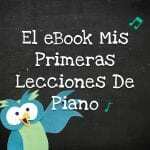 Wow, this is a fantastic post and really I love your blog! My 2 year old needs all the emotional affirmation she can get right now and I really want to do this with her. Thanks for the ideas! You’re welcome! Hope you and your daughter have fun with the Emotions Song! 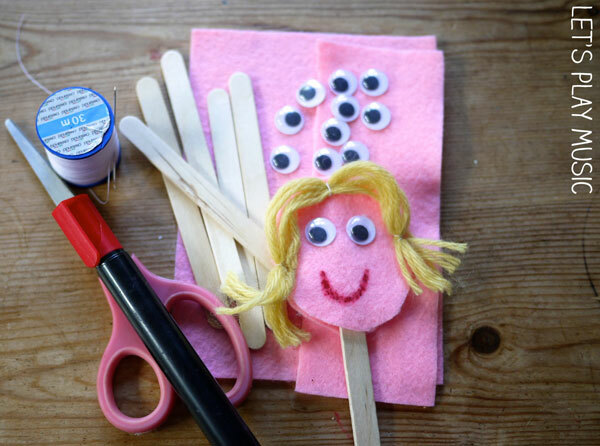 Thanks so much Miheala, I love the idea of using apple puppets you’d already made! Thanks for commenting and pinning too!